William T. West and Abel Kingsbury West were brothers and business partners who built the West House Hotel. After Abel’s death in 1880, William ran their partnership and in 1882 purchased this corner: Columbus Ave. and E. Washington Row. Abel’s widow and daughters, however, grew concerned with how William managed Abel’s estate when William purchased additional property along East Washington Row in his own name for construction of the Mahala Block. 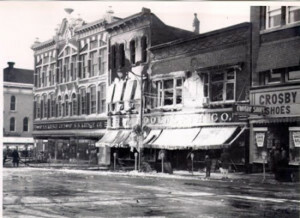 In response to William’s actions, Abel’s family filed a lawsuit against him in 1890 arguing that the brother’s partnership was legally dissolved by Abel’s death and demanding full ownership of this corner property. Abel’s family was successful in their lawsuit and won control of both the corner site as well as adjacent land along East Washington Row. In 1894, they developed this property with the Kingsbury Block, a large office building that stretched around this corner and became a popular location for many professional offices including doctors, lawyers, dentists, and insurance companies. 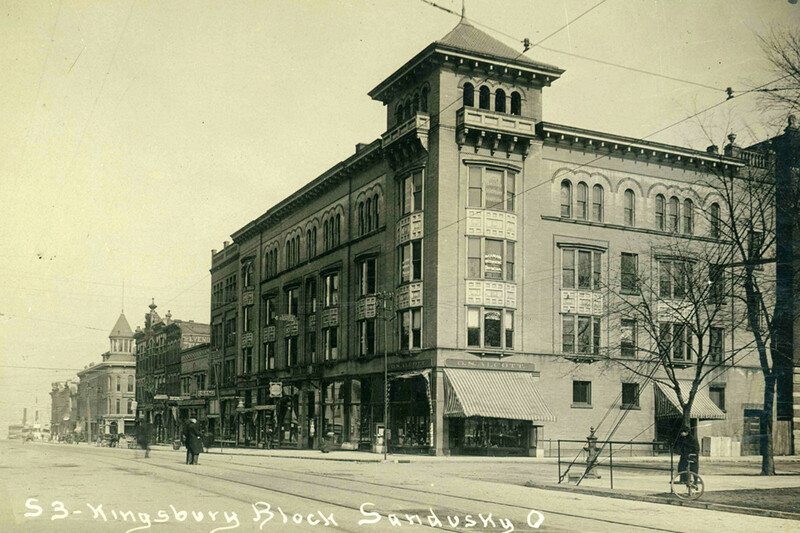 The Commercial National Bank purchased the Kingsbury Block in 1920 with plans to develop its new headquarters building on this site. In 1921, however, Commercial National merged with The American Banking and Trust Company to form the Commercial Banking and Trust Company, which proceeded with the project. Construction of the bank’s new headquarters required demolishing 38 feet of the Kingsbury Block along East Washington Row to clear space for the structure, and it opened to the public in June 1924. Looking at the building, it is designed with a “late Italian renaissance” style and appears from the street as having only two floors when the building actually has four stories. At the building’s opening, Commercial Banking and Trust’s management boasted of having “a record of nearly three-quarters of a century of uninterrupted and successful banking business” in the city, but the bank was ordered to remain closed after the March 1933 bank holiday declared by President Franklin D. Roosevelt and was eventually liquidated with its operations ceasing in June 1942. 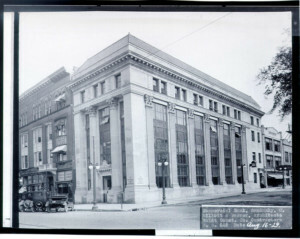 Although Commercial Banking and Trust failed in the Great Depression, its building was quickly occupied by Western Security Bank (first called Western Reserve Bank), which opened here in September 1933 and remained in this location for the next four decades. 970s, Western Security Bank moved to another building on East Washington Row and put this building up for sale. Calvary Temple agreed to purchase this property in 1974 and the church held its first service here on February 9, 1975. Calvary Temple remained in this building until the church relocated in January 2015. 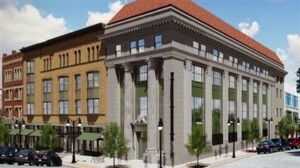 In August, 2016, the Sandusky City Commission voted to move a significant number of city administrative offices to the Kingsbury Block (planned upgrades shown here). Along Columbus Avenue you can see the remaining part of the Kingsbury Block which Commercial Banking and Trust later sold. In 1929 this building was acquired by the S. S. Kresge Corporation, which operated its second Sandusky store here until 1961. 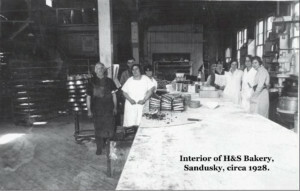 Other notable tenants of the Kingsbury Block during the 20th century included the H & S Bakery Company store (see below), Manhattan Clothing, The House of Fabrics, and Computerland. 202 Columbus Ave. – SE corner of Market and Columbus Ave. In July of 1919, the S. S. Kresge Five and Ten Cent Store leased the southeast corner of Market and Columbus Avenue for twenty five years. These stores were more like department or discount stores today, offering low cost items as well as fashions, home improvement, hardware and furnishings. 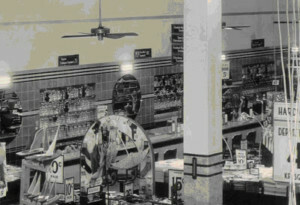 Views of the interior of the in 1930 show a lunch counter and several items for sale for under one dollar. During the Woolworth fire on January 12, 1960, the Kresge store suffered only smoke damage. 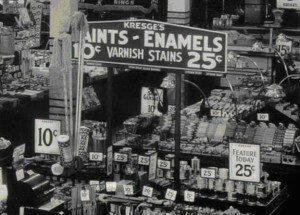 Like Woolworth, Kresge had a second store, it was also located on Columbus Ave.